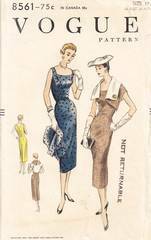 Vintage Vogue 8561 sewing pattern. Sleeveless, princess fitted dress has low neckline front and back. Released pleat at center back seam. Bolero with cutaway fronts below wide, shaped collar. Short kimono sleeves. Pattern is complete and has been gently used. Unprinted, precut and perforated pattern pieces. Envelope been repaired/reinforced on the edges with archival document tape.